As with last week’s piece, I noticed that Binary Domain, one of the best games of the year so far, was also missing a review. Might as well correct that oversight as well. There is a lot in Binary Domain that one could focus on in individual pieces, but what all of them have in common is the subversion of the modern conception of the third person shooter. It takes away a lot of assumptions that games of this ilk take for granted that you don’t realize it takes for granted and then decides to focus on them. Things like, who is the enemy? Why are the protagonists fighting? Why is no one getting angry for the blatant illegal activity/war crimes going on? You kn0w, the unimportant details. I’m being facetious, but you don’t realize how much is missing/glossed over or how much a game is just insulting you by assuming you can’t be bothered with simple questions. Most games seem afraid that you will run away at the first hint that there may be shades of gray or that the hero isn’t infallible under some definition of propped up machismo. 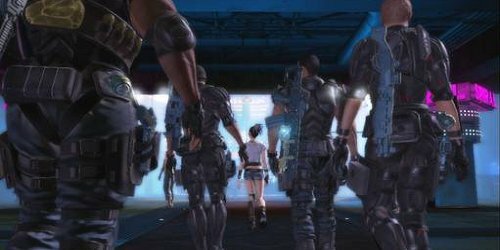 I like that Binary Domain at least attempts to treat you like you can think and wont be scared off in a situation where it’s okay to do so. If you want to turn off your brain and go along for the ride you can do that and the story wont break. There’s enough to be entertained on that level, but unlike other games of the genre where that behavior is a necessity to remain cohesive, Binary Domain allows further introspection. I’ve read elsewhere that the game is in fact a parody of such third person action fare through a Japanese viewpoint and sensibility. I can certainly see that. By the game’s very existence it seeks to challenge the genre by doing what others wont. The fact that the ending is one of the most delightfully ridiculous circumstances that I think I’ve ever seen come up that still made sense in the fiction just makes it all the more glorious. Of course, I also tilt my head at the reality that the parody is the smarter, more thoughtful game than the grimly serious game. It’s still an action blockbuster, but it is Inception, not Transformers. As for the review itself, I’m not as happy with it as I was with last week’s Driver one. It may be I’ve spilled more words on Driver and had my thought in better order or that Binary Domain needed more background details to explain the criticism of why it’s worth playing. Either way, you can read it on PopMatters now.